The subject of creating a free library was first introduced at a meeting of the Anna Shaw club in March, 1897. Due to difficulties in getting the project off the ground, the idea was brought to the three other women’s clubs in Friendship: the Progressive Club, the Travelers Club, and the Musical Literary Society. Members of the four clubs solicited donations of money and books from townspeople, as well as holding a variety of fundraising events. The Friendship Free library was first opened in a home on Depot Street in a front room rented for $6 a month. The shelves were built by the husbands of several club members, and the library was furnished with items donated by the ladies of the clubs. In 1902, the library was moved to a building on Main Street, and in 1906 it moved again to a building on West Water Street. The members of the women’s clubs continued in their efforts to raise the funds to build a building that would become the permanent location of their library. After several years, Mrs. William H Pitt bequeathed $12,000 dollars to be used to build a library building that would serve as a memorial to her husband, with the stipulation that it be known as the Pitt Memorial Library. In addition, she donated funds for the creation of an endowment for future maintenance of the building. The ladies of the four clubs purchased the present site and construction began immediately. The corner stone was laid at three o’clock on July 8, 1912 by Dr. Fuller, then President of the Village. 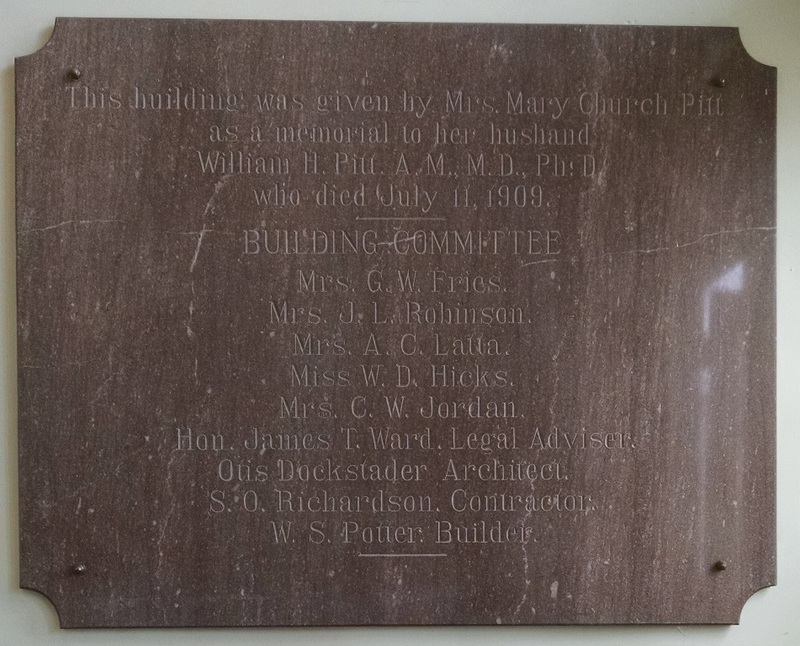 The sealed box contained several documents, including yearbooks from the four women’s clubs, documents detailing their history, a poem by one of the club members, and copies of the Friendship Register containing the obituaries of Mr. & Mrs. William H. Pitt, among other items.